This month's re-reads were books that "called" to me. Does that happen to you? I began thinking about the characters in both books and just had to revisit them and their stories. One is a historical and the other a contemporary romance and both by favorite writers: Dreaming of You by Lisa Kleypas and Rising Tides by Nora Roberts. What do these books have in common? Although quite different on the surface, at the core Derek Craven and Ethan Quinn share similarities, neither thinks they deserve happiness with the woman they love because of their past actions and violent beginnings. They are both hardworking men, content with their achievements, if not with their lives as a whole. They both love and yearn for their women with their whole hearts, and both find women who love and see them as they really are. I think it's interesting that these different stories written by two different authors with different writing styles called to me, yet in the end they did share a few common threads. As much as I would love to write about both books, at this time for Nath's 2010 Re-Read Challenge, I've chosen to write my review on the contemporary rather than on the historical romance. 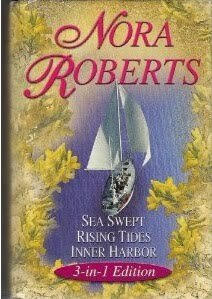 Rising Tides by Nora Roberts is the second book of the Quinn Brothers trilogy. This story focuses on the romance between Ethan Quinn and Grace Monroe. Why did this story call to me? Well, although this is the middle book and many will say not the very best of the three, in my opinion Rising Tides definitely glues this trilogy together. I loved the characters in the first book Sea Swept, but reading this book is where I fell in love with the Quinns as a family. I personally love Ethan's character. He is a quiet, strong and hardworking man with a rough abusive past that makes him vulnerable. The brother who stayed behind and works the Chesapeake Bay as a fisherman, and the type of man that once healed, any woman would love to have by her side. Ethan is also a one-woman man. He fell in love with Grace when she was a teenager and she is "it" for him. So there's unfulfilled yearning going on in this story that makes Ethan and Grace's coming together that much more effective when it happens. Grace herself secretly felt the same way about him, so it's a double-whammy in that respect. The other reason I love this book is the relationship factor. I've always admired Nora Roberts ability to create, build and sell relationships, and I've always thought the Quinn brothers as one of her best. The relationship between the three older brothers with all the arguing, fighting, teasing and loving is enough to make this a wonderful trilogy. But, their developing relationship with the youngest Quinn brother Seth, as he's introduced into their family after the death of their father Ray, takes the stories to a higher level. For me, this is where Rising Tides comes in. I always felt that this is where Seth is really brought into the family fold, and Ethan is the one brother who really made Seth feel safe, accepted and truly acceptable to the Quinn family. Roberts cleverly accomplishes this by intertwining Ethan's and Seth's storylines and having both characters work out their issues while the romance between Ethan and Grace is developed. Of course there's also the relationship between Ethan and Grace. There's lots of yearning and not a little interference that goes on this romance. Both characters carry baggage, some of them heavy and issues must be resolved before there's a happily-ever-after. Grace and Ethan, although in love, are both stubborn and each has his and her own battle to fight and win, providing the reader with both frustrating and satisfying moments as their relationship develops and they come together. This is a well-rounded book about love, family and healing -- a book I revisit once every so often when it calls to me. I love the richness of setting in the Chesapeake books, too. I love the bond that develops between Ethan and Seth. You might be right, it's the book in which Seth is really brought into the family... although he bonds with Cam really fast. Yes Victoria! Roberts exceled with the setting. I particularly enjoyed it in this book where the Bay itself and the fishing was such a big part of the story. Oh Nath... you make me want to read Sea Swept. I enjoyed the romance in this book, even though I experienced some frustrating moments with Grace. Hi Hils, I don't remember reading this book. I went through my collections books from Mariana and from my ePub downloads and guess what nada. I think I'll come back to NR sometime next month after christine's novels and the rest from yours. Thanks for a great review as always. Oh Natalie, this is the 2nd book in one of my favorite series by NR! The series goes by two titles "Quinn Brothers Trilogy" or "Chesapeake Bay Series." The titles are: Sea Swept, Rising Tides, and Inner Harbor. Then later on the 4th book was released "Chesapeake Blue."